Plus access to forums to ask questions which will be answered by a RWYM coach. Plus download a digital version of the book 'Master Dressage - The Basics' for free. Plus an extra BONUS Session. With focus on stability, tone and core you will learn how to sit better, be less effected by the horse's contortions and begin to shape the horse correctly through good rider biomechanics. Mary Wanless BHSI BSc is an internationally renowned coach, and is the author of the Ride With Your Mind books. She coaches riders at all levels, from relative novices to two of the top 12 US dressage riders, and some of the Canadian Eventing Squad. She has B.Sc. Degrees in both Physics and Applied Sports Coaching, and holds the BHSI certificate. Rode with the late Nuno Oliveira, and over the years she has spent many months training in Portugal. Mary has ridden in Germany with the late Egon Von Neindorff and has trained in Germany with Hans Heinrich Meyer-Zu-Strohen. An introduction to 'On The Bit', what it looks like, where it can go wrong and the influence that the rider has over the process. Mary also introduces you to your fascial net and how, once brought into balance, it can give you much greater control over our body. Mary will also talk about feel and how it is developed. This lesson sets out how the rider creates balance between the continuous lines of tissue that form the front and back of the torso and legs (the Superficial Front and Back Lines) The result is known as 'neutral spine', and it enables the rider to sit with a shoulder/hip/heel vertical line. Mary also introduces good breathing and how to access your core. The webinar includes great exercises which solve the typical rider imbalances that make 'On The Bit' more difficult. Mary also looks at the same lines of tissue in the horse, and how their (im)balance influences the horse/rider interaction. In this lecture Mary looks at the Lateral Lines (along the sides of the body) which effect both horse and rider on turns and circles. She provides exercises which give the rider greater stability on the side-to-side plane, and the ability to steer the horse's wither. A correct understanding of how to turn the horse without him jack-knifing (where the wither acts like a hinge) makes a huge difference to the typical contortions of horse and rider. Straightness also influences how securely and consistently your horse will work in the Seeking Reflexes. If think it is your job to make the horse's nose vertical you have misunderstood 'THE SEEKING REFLEXES'. You compromise those reflexes and inhibit a genuine reach into the rein when you resort to scrunchIng the horse's head and neck backwards by pulling back OR fiddling with the reins. You are then riding the horse from the 'front to the back' instead of from the 'back to the front'. Mary will show you how to organise your shoulders, elbows and hands so you can maintain a more wholesome contact, whilst also matching the forces of the horse's movement in your body. This solves many rider/horse contact issues, since not being able to match those forces leads to tension in the wrong places, and hands which pull back. 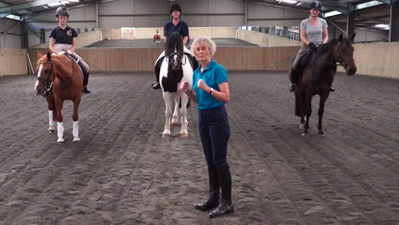 Mary discusses and demonstrates the Spiral Lines which affect side bends and lateral shifts in the rider. In the latter, the rib cage is displaced as Iit is in 'break dance', making the spine into an 'S' shape rather than a 'C'. The 'C' is the most common 'default' when riding circles on the rider's 'bad rein', But the 'S' is a more likely default in the lateral movements. In both cases, one seatbone becomes heavier as the other one lightens. Mary offers solutions that even out the weight on the seatbones and straighten the body's axis. This makes precision steering, 'bend', and good lateral steps much easier. She also talks about improving your head position, and discovering Spiral Lines in your legs. The Deep Front Line is an expanded version of what many people think of as the core. In both the rider and the horse it goes from (hind) toes to tongue - think of an apple core which has a rounded middle whilst connecting each end of the apple. When you can access your core, you begin to develop the stability, strength and finesse required to help the horse engage his core, and transfer his weight back. The course is based on the latest book from Mary Wanless, order your copy here. 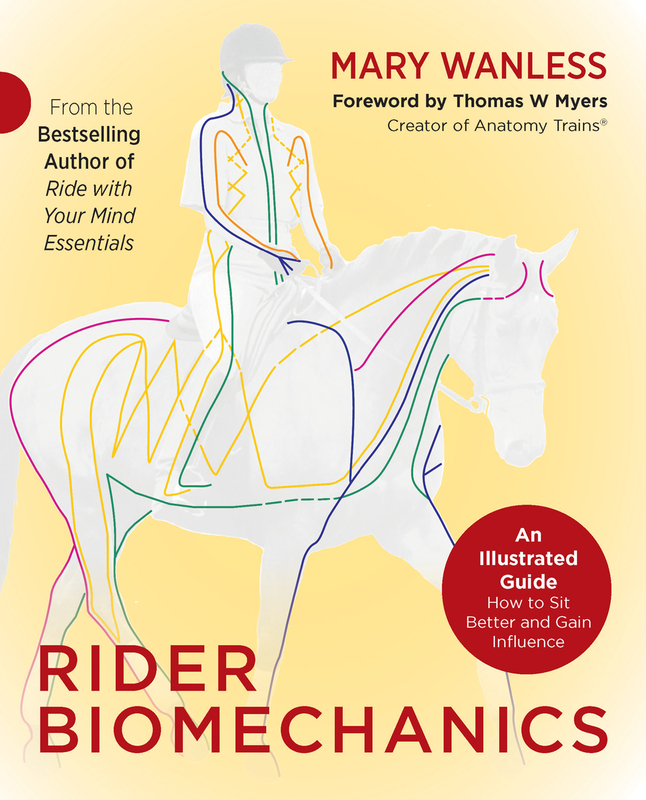 Rider Biomechanics begins by explaining fascia – the 'cinderella of body tissues'. Until recently, this was ignored by science, consigned to its apparent role as the body's packing material. However, research shows that in reality, this biological fabric links muscles into functional chains, just as the sausage skin links sausages. Recent research has shown that the horse's fascial system is remarkably similar to our own, with equivalent ‘lines of pull’ that affect posture, movement, stability and mobility. Inevitably, the problems inherent in sitting and riding well are magnified when there is imbalance within and between the fascial 'guy ropes' of rider and/or horse. Realise that imbalance in either partner can send the other 'out of true’, whilst the 'equipoise' of one partner helps the other to regain that poise. Talented riders use their well-balanced guy ropes to stabilise themselves and rebalance their horses. They also have enhanced ‘feel’, since fascia contains many more sensory nerves than muscles. These are registering the forces that pull on an area, and thus a ‘fascial net’ under tension creates a wellspring of strength and feel. This is denied to the majority who are more loosely strung – and however much they would love to be more quiet, effective riders, they are inevitably ‘bobbled about’ by the horse’s movement. But by working through this book, and learning to access and rebalance your own fascial net, your stability, skill and ‘feel’ can be significantly improved. Rider Biomechanics first addresses the 'outer sleeve' of the body. Whether you tip forward, tip back, round your back or hollow it, your habits are based on fascial imbalance. So is the enhanced difficulty of circling in one direction. Practical exercises, enhanced with copious photographs and diagrams, show how to balance your front and back, right and left – yielding skills that simultaneously address the equivalent imbalances in your horse. Mary then explains how effective force transmission within the fascial system enables the rider to push her hands forward, taking away the temptation to pull on the reins. Later chapters show how twists and distortions in both human and horse can be addressed through accessing the fascial lines that wrap diagonally around the body. Lastly, a look at the core of both partners shows just how profound their connection can become.